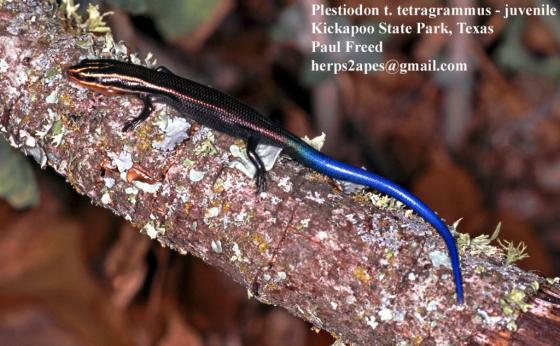 Can you confirm these amateur observations of Plestiodon tetragrammus? 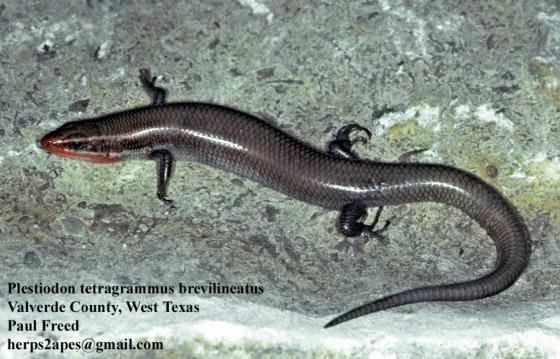 brevilineatus: USA (Texas), Mexico (Tamaulipas, Nuevo Leon), USA (S Texas). Type locality: Helotes, Bexar County, Texas. tetragrammus: Mexico (Tamaulipas, San Luis Potosí, Veracruz, Nuevo Leon). USA (Texas). Type locality: “Lower Rio Grande”. Later indicated as “Matamoras, Mex.” by BAIRD (fide SMITH & TAYLOR 1950). Comment Distribution: Mesa de la Estacada, 4.3 km S, 8.5 km W Mineral El Realito (21º 33’ 43’’ N, 100º 18’ 59’’W; 1360 msnm), municipality of San Luis de la Paz, Guanajuato, México [Campos-Rodríguez et al. 2009]. Not in Sonora according to Enderson et al. 2009. Genetics: P. multivirgatus acquired its mitochondrial genome from P. tetragrammus after their initial divergence (Moseley et al. 2015). Etymology According to Lieb (1990) and Lemos-Espinal and Smith (2007), the specific name was derived from the Greek words tetra, meaning "four" and gramme meaning "line," in reference to the four dorsal stripes (Lemos-Espinal & Dixon 2013).